People have been asking me about my set up that I use. 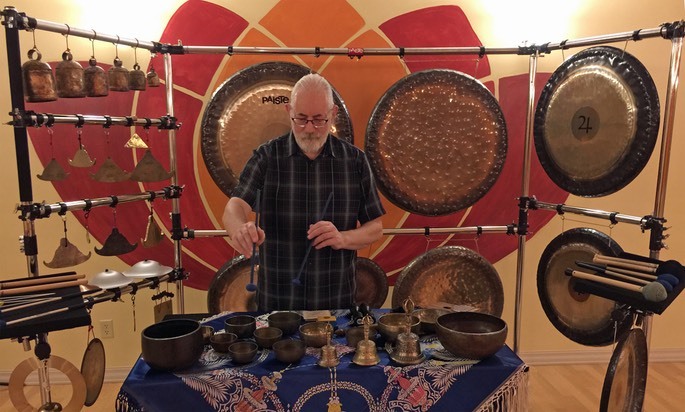 I generally have 1 basic set up that I use for all occasions: Gong Meditations, solo performances, and performances with others. 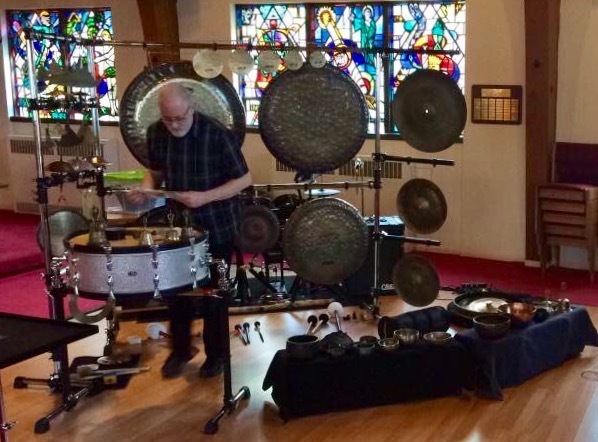 The instrumentation will vary with the type of music being played, the size of the stage/venue, and mostly what instruments I feel like playing at each given moment. 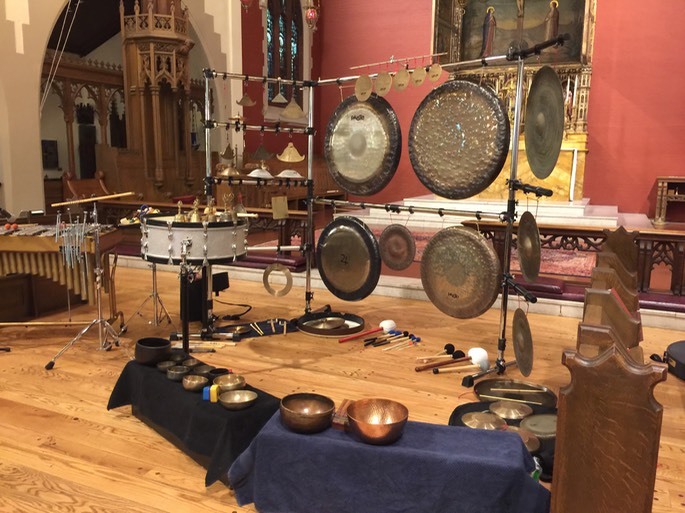 Here’s my gear from August 2018 when I played a duo concert with GONGTOPIA TAIRAKU. My set up has evolved once again with the addition of the copper clad iron bells in the upper left, and some miscellaneous small bowls, bells, and shakers. I’ve also raised everything off the floor with the new table in front, and the mallet tray on the left. I’ve since added a matching mallet tray on the right. You can see that he basic set up remains the same as the July 2017 photo further below, but is always evolving as my musical vision widens. Below is a July 2017 photo of most of my basic set up. Below that is a list of instruments in the set up. 1) 4 - Burma Bells and 1 - Martin Bläse Trigon tuned to the Sun. Immediately below are a Paiste 6” Bell Chime and a very old UFIP 6” Ice Bell. 2) 4 - Burma Bells. Below them are an old UFIP 9” Ice Bell and 9” & 10” Paiste Pure Bells. 3) An old UFIP Ictus 75 12” Lokole and an L’Govsky Bilos/Bell Plate tuned to E.
4) Difficult to see because it’s turned away from the camera is a 12” Paiste 602 Ring Chime that I made from a broken cymbal. Also, missing from the left side of the bar is a 12x12” aluminum Bell Plate. 5) 32” Paiste Symphonic Gong. This is my main Gong. I base all my other sounds around it. 6) 32” Paiste Sound Creation #3 Earth Gong. 7) 28” Paiste Jupiter Planet Gong. 8) 13” Michael Paiste Volcano Gong. 11) 1-Rin Bowl and 4 Singing Bowls. Not seen: on the right side of the rack I usually have an old 24” UFIP Tampang and a 24” Paiste Venus Planet Gong. On the floor I usually have 5 Drilbu hand bells of various sizes/tunings, 2 small wooden shaker boxes, and an old Hugh Tracey alto Kalimba. 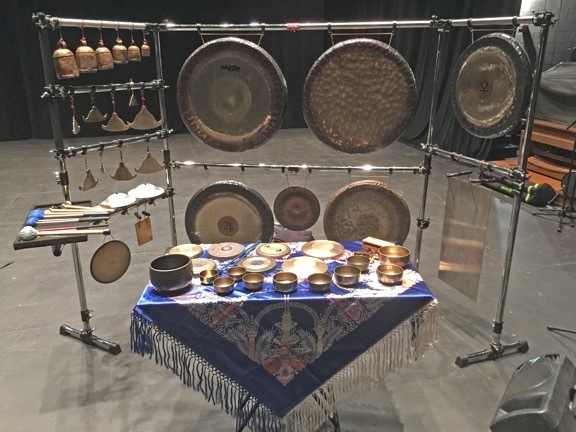 December 2018 - The Gongs have shifted, with the Jupiter moving up to the far right, and the Sound Creation #4 Water Gong taking its place on the lower left. 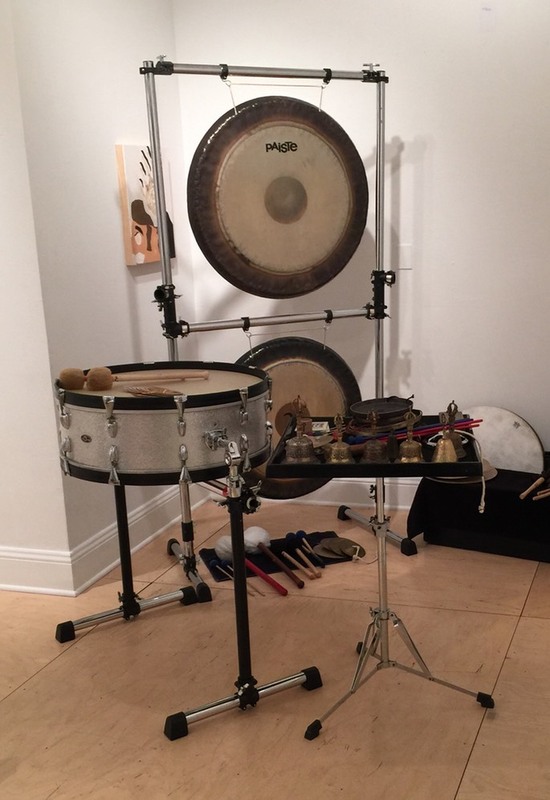 The Venus Gong has moved down under the Jupiter, replacing the large bell plate, while the 22” Accent Gong is under the mallet ray on the right. Above is a solo concert photo from April, 2017. In addition to what is shown in the 1st set up photo, on the far right of the rack there are 3-UFIP Tampangs: 24/16/15.75”. In the front left is my 10x26” Slingerland Haskell Harr model Scotch Bass Drum that I often use as a sound table. Here is another view from a concert in April 2017. You can see the Ring Chime on the rack to the lower right of the bass drum. There is also a set of 5 UFIP Ogororo Bell Plates above the 2 large Gongs. 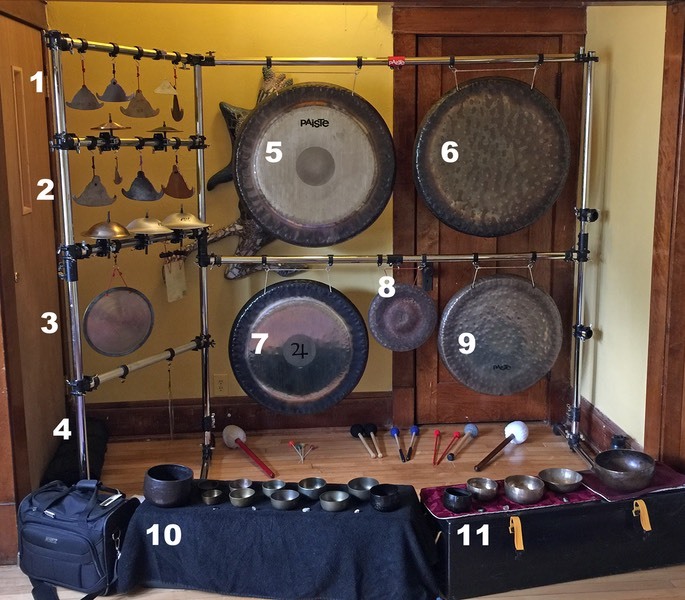 Also, in the lower right of the photos are some small Chinese Opera Gongs and Paiste Accent Gongs. 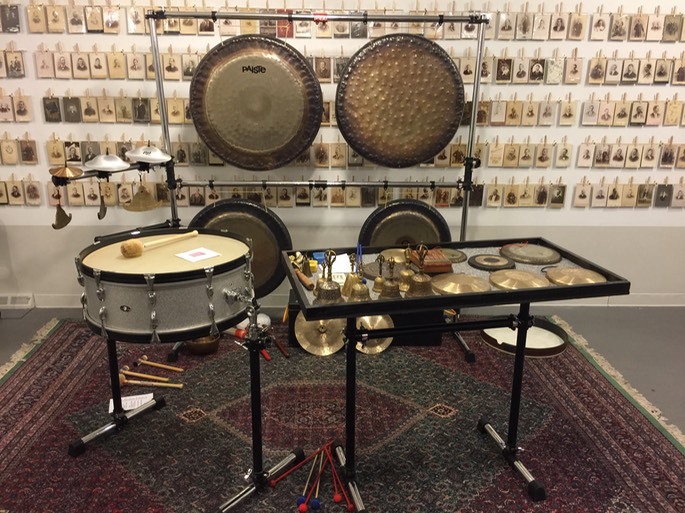 Above, from June 2016, is the main part of the Gong rack without either side, except for 1 wing arm with bell cymbals and bells. The front is my bass drum and large trap table. Above, from March 2016, shows ½ of the main rack without either side. The front is my bass drum and small trap table.